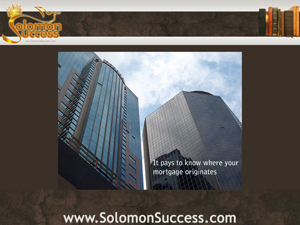 Solomon Success > Blog > Where Does Your Loan Come From? Much of King Solomon’s reputation as a strong and fair ruler comes from his words in the Book of Proverbs, where he emphasizes again and again the importance of wisdom, knowledge and prudence in all things – for blessings come to those who live by those concepts. “Say to wisdom, thou art my sister, and call prudence thy friend,” he says in Proverbs 7:4. Now, income property investors negotiating the complex world of mortgage lending need to call wisdom a sister and prudence a friend. In many circumstances, that can begin with knowing who actually owns the mortgage that finances a property. Why does it matter who owns your loan? In general, it doesn’t matter much at all. If a property owner holds a 30 year fixed rate mortgage, as Jason Hartman advises, or even most other common loan products, as long as payments are made on time and no problems arise, it’s possible to continue for the life of the loan without knowing – or caring — where it really originated.